Robert C. Morris - FitzGerald Morris Baker Firth, P.C. Robert C. Morris is one of FMBF’s Founding Partners. Mr. Morris is currently Of Counsel to the firm, utilizing his vast experience primarily within the Business/Real Estate practice group. His concentration is in business law, corporate law, municipal and public entity law, municipal public finance and commercial finance. 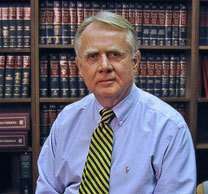 Mr. Morris joined the firm as an Associate Attorney in 1966, and was named a Partner in 1970. He served as Managing Partner from 1988 until becoming Of Counsel in 2006. Mr. Morris is admitted to practice in New York State and the United States District Court, Northern District of New York. Mr. Morris earned his Juris Doctor from Albany Law School of Union University. He received his undergraduate degree from Colgate University. Mr. Morris is a member of the New York State Bar Association, the Warren County Bar Association, and the National Association of Bond Lawyers. Additionally, he is affiliated with the New York State Economic Development Council and the Business Council of New York State. Mr. Morris is a past Deputy County Attorney for Warren County as well as a past Attorney for the City of Glens Falls, New York. Mr. Morris is a past President of the American Cancer Society, Warren County Unit; past President of Trustees for the First Presbyterian Church; past President of the Glens Falls Historical Museum; and past President of the Glens Falls Country Club. Mr. Morris is a past Master of the Glens Falls Lodge 121 F&AM. He sits on the Regional Development Board of the Glens Falls National Bank and is the Treasurer of the Lake Side Chapel in Cleverdale, NY. Mr. Morris also serves on the Board of Directors of the Lake George Club Real Estate Company. Mr. Morris is a Martindale-Hubbell AV Rating Preeminent, he is listed in the Bond Buyer’s Municipal Marketplace (“The Red Book”) and is also listed in Who’s Who in American Law, 9th Edition.